An additional feature has been added in the Media under the Add Audio section. 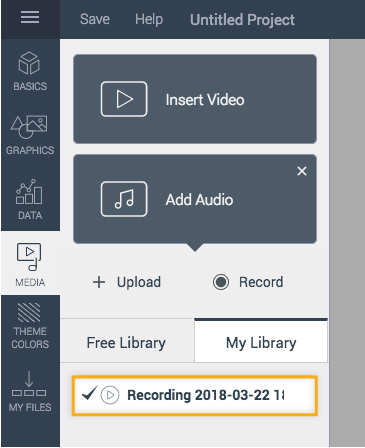 Now, Visme allows the ability to record audio which will provide you the option to save your recorded audio to My Library (located under the Add Audio option of Media) and allow you to insert it directly to your presentations or infographics. Let’s get started! In order to record an audio, select Media from the left panel. You then click on the Add Audio option. 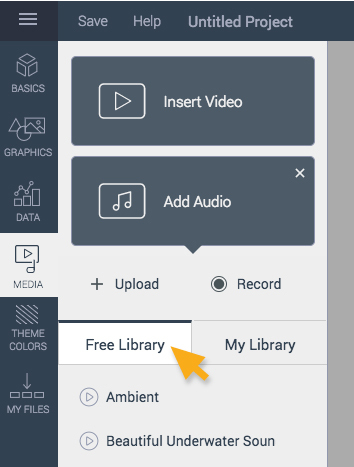 Note: We also have free audio available to you under the Free Library tab of the Add Audio option. You will see an Upload tab and a Record tab. Select Record. In order for your recording to be successfully added, you have to click Allow for the microphone to be accessed by the application. You will then see an audio recording pop up at the bottom of the page. To start recording, click on the red circle from the left-hand side and begin to speak on the microphone. You will know that it’s recording when you see a word that says Recording on the right-hand side beside the recording length. Once you are done recording, click on the red circle again. 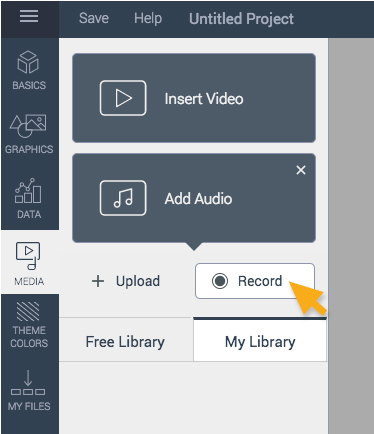 You have the option to save your recorded audio into My Library by clicking on the check icon on the left side of Save to Library Ready. If you don’t like your recording and would like to start over, you can repeat previous steps to record a flawless one. Your recording will be added in My Library of the Add Audio option in Media left panel. Your recording will automatically be attached to your project. Learn more on how to customize audio settings. – Whenever you wanted to rename your recorded audio into something more user-friendly, you can do it after attaching the audio. Click the Gear button beside the recorded audio and select More Settings. It will take you to Audio Settings which lets you do what you want to do with the attached audio. 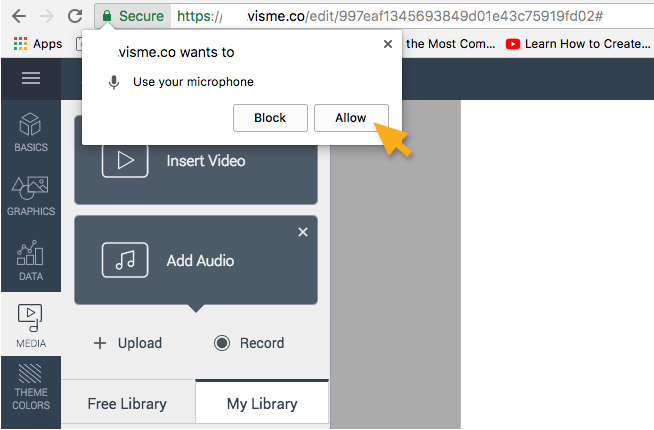 – For a more in depth coverage of Audio features in Visme you can also visit our Visual Learning Center’s audio voice over topic.